While the majority of designs were for wood sailboats, there are also numerous examples of other types of watercraft-powerboats, houseboats, sport fishermen, trawler yachts, motor sailers, etc. for construction in steel, aluminum, fiberglass, and ferro-cement. Al preferred to design small boats (20-45 feet) that the average individual would have the means to build. 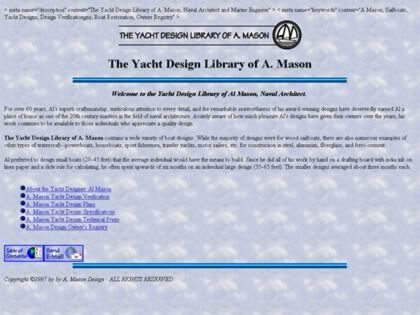 Web Site Snapshot: If available, above is a snapshot of the The Yacht Design Library of A. Mason web site at http://www.a-mason-na.com/ as it appeared when this site was added to the directory or last verified. Please Note that Boat Design Net has no involvement with the above web site; all content and images depicted in the above thumbnail are the property and copyright of The Yacht Design Library of A. Mason unless otherwise noted on that site. Description: While the majority of designs were for wood sailboats, there are also numerous examples of other types of watercraft-powerboats, houseboats, sport fishermen, trawler yachts, motor sailers, etc. for construction in steel, aluminum, fiberglass, and ferro-cement. Al preferred to design small boats (20-45 feet) that the average individual would have the means to build.